Hellooooo out there! It’s been QUITE a while since I posted anything on here. I moved to back to my hometown which is farther away from work and became a “commuter”. My days are much longer and everything isn’t quite unpacked yet. But I have made a blog re-dedication plan so I’m back!! I’ve done a few designs since then and I kept my nails painted for the most part but I didn’t have anything that was blog worthy but I’m ready to get back on the ball. So while looking for clothing inspiration for fall, I stumbled upon the Thakoon fall collection pictures and this fall jacket LEAPT off the page. That plaid is AWESOME! Let’s not talk about how the jacket is $2,450….*cough*. Here‘s a link to their fall lookbook. But that pattern is gorgeous and as it turns out, it is directly inspired by the Masai tribe of Kenya, who use this red-blue plaid in their fashion. Shukas, as the Masai call them, are traditionally worn during the day to shield the sun and to protect from the cold at night. 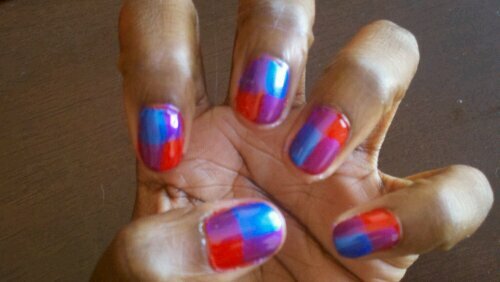 For my nails, I used Wet n Wild Everybody Loves Redmond (red), Sally Hansen HD Blu (blue), and Sally Hansen HD Cyber (purple) to mimic the color-blocking of the red-blue plaid. Now if you’re interested in adding this pattern to your wardrobe for about 10% of the cost of that awesome fall jacket, Thakoon is offering a Masai Plaid scarf for $250 on their site and 100% of the proceeds are going UNICEF to fight hunger and malnutrition in the horn of Africa. I have to admit, $250 is pretty steep for a scarf but I appreciate Thakoon for using the beauty of this fabric to give back to those who need it the most. Check out the donation and scarf ordering page here. Look for more fall fashion manicures on this site coming soon! I wear my pink pajamas in the summer when it’s hot. I wear my flannel nightie in the winter when it’s not. I jump beneath the covers with nothing on at all! Glory, glory, hallelujah…glory, glory what’s it to ya? Balmy breezy blowin’ through ya, with nothing on at all! Does anyone else remember this totally-inappropriate-for-kids camp song? Well it popped into my head and to honor the end of winter and the approaching balmy spring weather, I decided to do one last winter-themed manicure. I was going for that blue/green/red plaid flannel pattern that reminded me of flannel pajamas but I jazzed it up with a bit of silver. For this look I used 3 China Glaze colors: Frostbite for the base color (a frosty, shimmery cobalt blue), stripes of Jolly Holly (a deep rich forest green from the 2010 Holiday collection), and stripes of Phat Santa (a rich red creme also from the 2010 Holiday collection). I used Art Deco’s silver shimmer nail art striper for the silver stripes. So ready for spring’s pastels and brights! Mintosee.com (@mintosee)This is really cute, especially the robot. Mintosee.com (@mintosee)Love the colour combinations of the first one. Clumps of Mascara nail polish (and lots of other beauty) posts for brown girls!